As I am now involved in this ambitious project to promote and develop Saint Laurent du Maroni as a commodious stopover for visiting yachtsmen, I might as well pass on the following supplementary information…. Despite what noonsite states, Saint Laurent is in fact situated on the Maroni river rather than the Moroni…., though I must say that the later does have a certain humorous dyslectic ring to it. Saint Laurent du Maroni is an official point of entry. Visit the PAF (police aux frontières ) at the car ferry to have your passport stamped (entry and exit). Not obligatory for European citizens, but prevents issues when your next stop is Suriname. Customs (la douane) is in the administrative center. 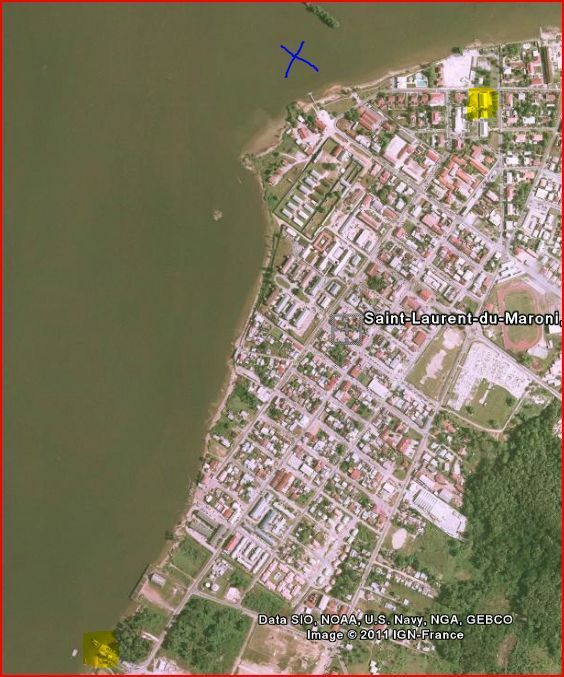 See image for directions (X marks anchorage, yellow highlights for offices mentioned above). 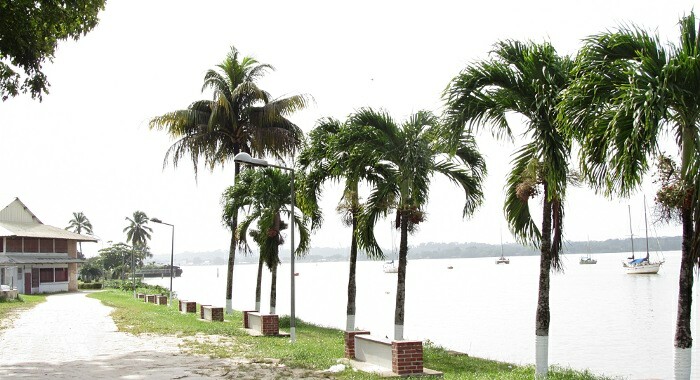 Saint Laurent is approximately 15 miles from the mouth of the Maroni River. 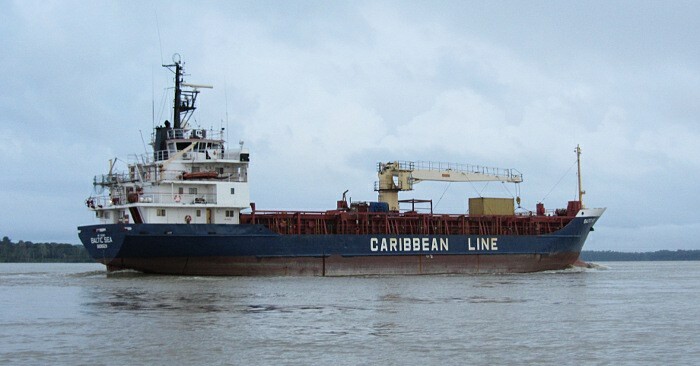 A buoyed channel for cargo vessels marks the route (3m minimum depth at high tide). If in doubt (buoys are widely spaced), keep as close as possible to the French side of the river. Beware of fishing nets when approaching the Maroni river’s safe water mark. While night entry is possible, it is not recommended as buoys closer to Saint Laurent are not lit. Yachts anchor on the upriver side of a semi-submerged (tree covered) wreck in 4 to 6m. Holding in mud and sand is good. The anchorage is within walking distance to all amenities and the city center. The tourist office is situated beside the anchorage. A public swimming pool is located at the opposite end of the park from the tourist office. Water by Jerry can from the old prison yard (turn left upon entering the main gate. Fuel at local service stations. Several Internet hot-spots,and cybercafes in town. Development is currently underway for a marina, providing finger pontoons, mooring buoys, secure dingy dock, club house, and Wi-Fi. This entry was posted in France and tagged anchorage, climate, customs, facilities, information, local services, marina, noonsite, PAF, paperwork, police, provisioning, sailing notes, Saint Laurent du Maroni by admin. Bookmark the permalink.